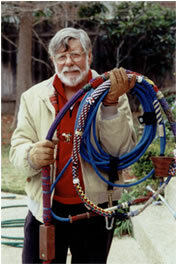 The Reep Rope was designed and executed by Sam Lanham, a retired Presbyterian minister. The rope is 55 feet long and knotting is applied on the lower 14 feet. The knotting materials consist of hemp, cotton, waxed and unwaxed linen, artificial sinew and braided nylon. The knotting on the rope is estimated to contain 600-700 feet of cord. The following is an explanation of the symbolism in the knots and objects interwoven in the rope. The core of the bell-rope is a 1/2 inch nylon static (low stretch) rope used for caving and mountain rescue. Its function is symbolic of what God in Jesus Christ has done for us; the royal blue color is generally associated with the Presbyterian Church. The rope is named for and dedicated to W. Harold Reep. Harold. A church member for 60 years, was born in 1910 and died in 1992. For over 35 years he rang the church bell every Sunday morning. In various places on the rope there are small blue Turk’s head knots. They are for the installed ministers who have served the Mendocino Presbyterian Church. I didn’t try to put them at the beginning or end of their years, just in the generally applicable location. We included only those who were officially installed as pastor. There were, of course, many more interim and temporary supply pastors, some of whom served as long or longer than some of the installed ones. The eight-strand star knot in hemp with imbedded mustard seeds (See Matthew 17:20), memorializes the 8 faithful souls who organized Mendocino Presbyterian Church in 1859. The red linen whipping commemorates the Methodist ministers who helped start this Presbyterian Church. The redwood symbolizes the importance of lumbering in the early days of the church, the leadership of Jerome B. Ford and of Peter Kelley. The rawhide, hemp, linen and cotton in this early period are the materials of the pioneer era, commemorating the toughness of the folk of the day. The blue and the butternut linen combined in square knotting symbolize the ‘sides’ of the conflict and as the conflict grew more intense it erupted into an increasingly bloody war with the blue becoming dominant at the end. The two white and one purple Turk’s head knots commemorate the first baptism, first wedding, and first funeral, respectively, in the congregation’s history. 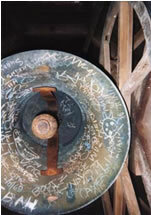 The Meneely Bell, donated by J. B. Ford was installed and dedicated in 1871. William McArthur turned the replica in redwood. The transition period from frontier days to more settled times is symbolized by three Turk’s head knots in which there is a gradual shift from old (cotton) to more modern (nylon) materials. Church was very involved in the Temperance Movement from the beginning of this period. White was the color used by that movement. This was mainly a woman’s cause and was closely associated with the Women’s Suffrage movement. A globe knot in red, white and blue marks the turn of the 20th century as optimism continued. The early years of the new century were marked by numerical growth at Mendocino Presbyterian Church and the liturgical colors are introduced. The swelling of the membership to a new record high is represented by the increase in the diameter of the rope. The 50th anniversary was celebrated in 1909 and is represented by the gold Turk’s head knot. The population of Mendocino began a gradual decline after that point and so did the membership of the church. Approaching war foreshadowed the turbulence of the next ninety years. A Turk’s head knot in red, white, blue, and black combines the patriotism of the time and the darkness of the first major, worldwide war. A white Turk’s head knot marks the passage of the 18th Amendment and the beginning of Prohibition, a victory no doubt celebrated at Mendocino Presbyterian Church. It is also intended to denote the passage of the 19th Amendment granting the vote to women. The decade after the war was notorious for its bootleg liquor, wild parties, and new cultural styles. These characteristics are represented by square knotting in which the stresses are diametric. The liturgical colors are placed in tension with wilder colors, with white, a liturgical color and also the color of the Temperance Movement, locked in combat with black, representing the dark side of Prohibition. The black Matthew Walker knot represents the market crash of 1929 and the beginning of the Great Depression. The depression was a difficult time for the entire country but a particularly hard period for Mendocino. The collapse of the lumbering industry in the area caused severe losses in all parts of the community, including the Mendocino Presbyterian Church. Although the membership and finances declined precipitously, the congregation, represented by the blue colored strands and the net of sinew, by God’s grace ultimately made it through those times by being faithful to its calling. The plain colors and the random knots in the texture of this section are intended to refer to the daily struggle to make ends meet. The Second World War, possibly our least controversial war politically, is represented by a Turk’s head knot in red, white, blue and camouflage-colored cord. WW II ends with the dropping of the first atomic bomb, the cloud represented here by a globe knot with fire and smoke and a blackened earth beneath it. The postwar 1940s and the 1950s were a time to regroup on the home front but a time for war in Korea. The home front is represented in red and blue, the Korean Conflict in camouflage. The two gold Turk’s head knots mark the 100th anniversary of Mendocino Presbyterian Church. The tumultuous 1960s and early 1970s were known for loud colors, loud music, and loud social protests. This section of the rope tries to reflect those bumpy times. Many of the members of Mendocino Presbyterian Church were involved in the protest against the Viet Nam War, in which our increasing involvement is symbolized by the contrasting swirl of camouflage hitching. There were, however, many members of Mendocino Presbyterian Church who did support the war. It was during this time that Antioch Ranch, represented here in red, provided a place for spiritual growth for that generation who were dissenters against the more traditional forms of the church. The knots in the final few inches of this section are rougher and more confrontational as positions on this matter hardened. The section of crown knots in purple bounded by two green Turk’s head knots is the grip for the bell-ringer. The crown knots in this and other parts of the rope are symbolic of Christ the King. In the early 70s, a rebound from the difficult years that preceded it, the congregation moved toward a more conservative/evangelical theological position and called a minister who reflected this shift. At the top of this section is an Eva knot, which is two Turk’s head knots intertwined one inside the other. Here the red Turk’s head knot, representing the evangelical, is the dominant outside knot and the blue, inner Turk’s head knot represents the institutional or traditional church. During this period some conflict arose between the two groups (represented by the ‘bump’‚ in the middle of the section) but by the end of the period this had been resolved and the congregation was stabilized in its traditional form. The Eva knot at the bottom of the section has a blue Turk’s head knot as the outside knot with a red Turk’s head knot nested inside. The dedicatory cylinder of redwood burl is one of the most beautiful pieces of wood I’ve ever handled. It speaks to me of the beauty and unity in diversity visible in the Mendocino Presbyterian Church. 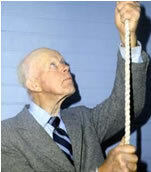 The Reep Rope is named for and dedicated to the memory of W. Harold Reep. Harold, a church member for 60 years, was born in 1910 and died in 1992. For over 35 years he rang the church bell every Sunday morning. Mendocino Presbyterian Church in the last years of the 20th century has diversity and unity, represented by crown knots in the liturgical colors within the fold of the Lord Jesus. The globe knot represents the world in the liturgical color we use for Christmas and Easter and is a statement of mission. The knob knot at the end closes out the 20th century. The fob is a marvelous piece of redwood drift from the beach at Mendocino. The green Turk’s head knot and the gray-brown wood call us back to basics as we enter the 21st century. The inlay in the gold bevel is a piece of the heat shield from the Apollo project and announces our arrival at the space age. Below the fob at the very end of the rope is another 8 strand star knot, this one in green nylon, imbedded mustard seeds of the Faith by which we face the future assured of the grace of God, the Father, Son, and Holy Spirit. We are indebted to the following: (In Texas) Sam & Missie Lanham, Sam Lanham, IV, Mitchell. (Mick) McCorcle, Brooks McCorcle, M.Graham McCorcle, Ann Anderson, Joe Brooks, Wayne Lewis, Gary Sessions and Uta Hale. (In Mendocino), George & Betty Storz, Warren & Ginny Wade, Loisjean Raymond, Don & Wilma Tucker, Grace Sharples, Willi McArthur, Bob Droz and Wendell Rickon.